Everyone knows vacation time is important in order to rest, relax, refresh and rejuvenate, but not all of us will have the opportunity to get away this summer. Whether you're new to the job and haven't built up the vacation time yet, or you already used it all earlier in the year to attend your second cousin Winnie's wedding in Winnetka, CareerCast.com has come up with some interesting ways for you to take a little time off without even leaving the office. "Most people don't use the full vacation days they deserve for fear of repercussions from their boss, or because they prefer to cash in their vacation days rather than take the time off," says Tony Lee, publisher, CareerCast.com. "If you're stuck in the office over the summer while everyone else is on the beach, there are ways you can re-energize and feel more productive without leaving your desk." Set the timer – Check email and respond only at certain times. By managing your schedule, you'll feel more productive and won't get sidetracked. Hop on the musical time-machine – During your workday, listen to music from your favorite vacation spot or memory. Most radio stations stream live music online all day. Caution -- use earbuds. 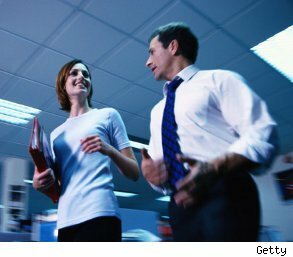 Take a walk – Grab a co-worker, go walking and talk about your work projects (or not). Say goodbye to clutter – Clean off your desk and your files to feel better organized. Relax and get centered – Take 10 minutes for deep breathing and relaxation in a quiet place. Unplug yourself – Leave technology at the office during your breaks. Network – Use downtime to catch up with old friends and colleagues. Be one with nature – Eat outdoors and get some vitamin D.
Don't skimp at lunch – Take the full time you're allotted to meet with friends and laugh a little. Taking time out for our families, our sanity and ourselves is an important part of life. These mental breaks help our brains re-energize, help us to feel renewed and, in the end, be more productive. Even if you can't physically get away on vacation, find ways each day to make time for you.